Today I want to share a canvas that I did a little while back. To start out, I covered my canvas in 7Gypsies 6x6 paper, from the Paddington paper pack. Next, I painted on a border with FolkArt, the color Aqua. Now, I went to the Cricut, and cut out Imagine using the Plantin Schoolbook cartridge. Now, I used the Cuttlebug. I inked the inside of the folder with Colorbox Cat's eye's in Magenta, then used the Cuttlebug like you normally would. I modpodged all the letters on, and then I painted the rest of the background with the same blue, leaving the area areound the letters blank. Then I came in with Master's Touch Acrylic in Perminant Red, and lightly washed over the area behind the letters, so that you can still see the papers underneath. Now, I took a stencil and randomly stenciled on some gesso to give the canvas more texture. And now, for the last step. I found that my letters faded a little into the background so I went aroung them with white ink, not neatly, of course! And then I used my black paint to make the letters 'POP' out at you. I loved this canvas so much, I have it hanging on my wall. I love the colors, and I am very satisfyed with it! I hope you enjoyed the steps and that I inspired you! Have a very happy Hump Day! 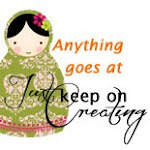 Joyful Stamper-Inspire Me Fridays: Anything Goes. This is absolutely stunning work! As I am a lover of letters of any kind, I sooo fell in love with your wonderfully textured letters on this canvas!!! Fantastic!!!!! This is gorgeous. I love the painterly effect and the colors are great. Thank you for joining DL.ART 1,000 post linky party.